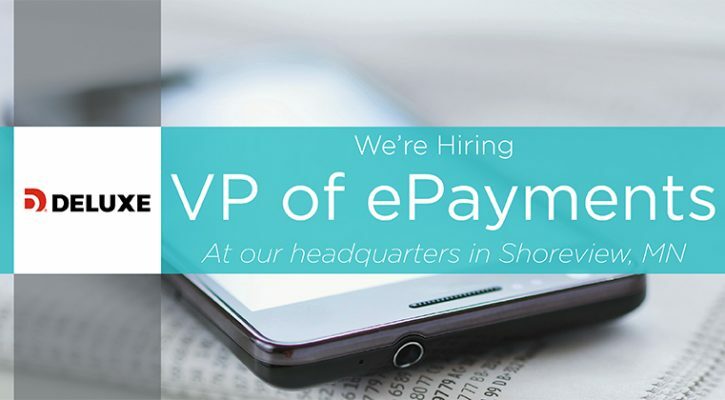 We are currently hiring for a VP ePayments at our headquarters in Shoreview, MN! This leadership position in our Product Management division will focus primarily on our managing our eCheck service. Tune in to the video below to watch a message from George May, VP of Product Management and Marketing at Deluxe, talk a little bit more about this opportunity. This is a great opportunity to continue your career at a well established and continually growing organization. The Vice President, ePayments Strategy will lead all efforts related to payments services in the Small Business Services division. Duties include overseeing the Deluxe eChecks business, strategy development and communication related to payments. The person in this position will also represent Deluxe at various standards and industry groups directing payments standards and regulations. Interested in learning more? Click here for more information about the role and to APPLY TODAY!